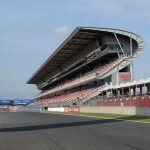 Circuit de Barcelona, often known as Circuit de Catalunya, is the arena for several big events every year. The most famous event is the Spanish Grand Prix where the hottest Formula 1 drivers on the globe gather together to compete against each other. In addition there is an annual MotoGP event taking place at the Circuit de Barcelona.